I first tried making these moreish little cakes about a month ago. They’re super moist (‘dejligt svampede ‘, as my Danish colleague said, which translates roughly into ‘nice and mushy’ – which appeared to be a good thing). Aaanyways, these are super moist, super quick to make, and super easy to eat. And who doesn’t love carrot cake? I really don’t know. 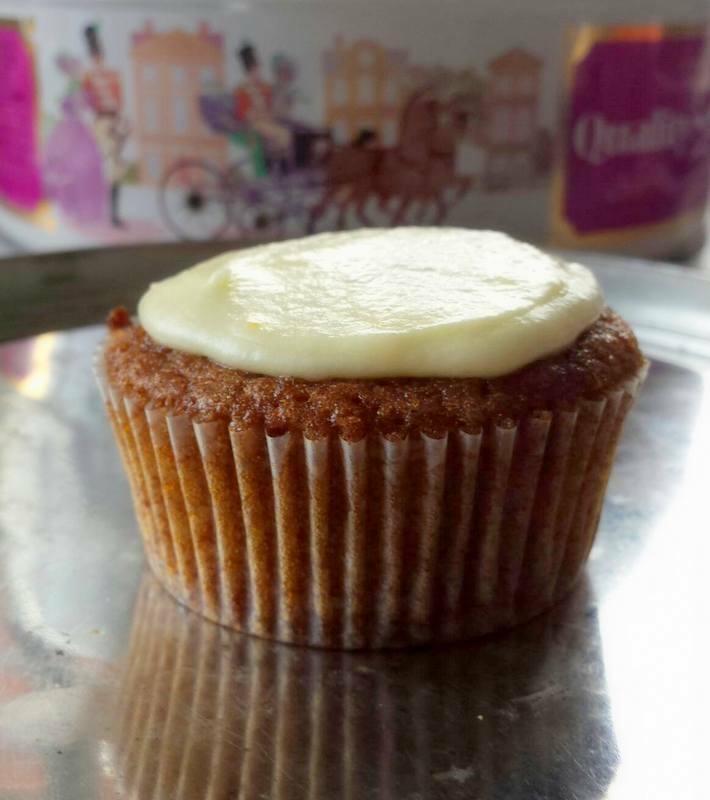 The first time I made them it was without frosting, as I’m really not a fan of cream cheese frosting, and I personally think that carrot cake is so delicious on its own that it really doesn’t need any frosting to begin with. I know that to many this is a slightly controversial statement, and I know a lot of people go mad for cream cheese frosting, but… meh! I don’t know, it just doesn’t do anything for me. And neither does buttercream frosting, I find it a bit off-putting and not all that interesting-tasting… BUT – on this particular Sunday, feeling adventurous, I decided to google ‘alternatives to cream cheese frosting’, and came upon an orange frosting that uses a little bit of butter, but not enough to be off-putting to me (don’t get me wrong, I LOVE butter in cake, and on fresh bread or toast, but I just can’t see the appeal when it’s mixed into sugar and milk and vanilla, in an unbaked form…). While I really liked the orange frosting, I still didn’t find it tangy enough, so I added some fresh lemon juice, and lo and behold, it turned into a lemon-orange frosting delight! At least I think so 🙂 And my colleagues seemed to really enjoy them when I brought them into work! Though they do tend to be rather forgiving whatever type of (more or less successfully) baked good I bring in, they were especially vocal about these ones. I’ll test the few ones that are left on my friends later today. Line your cupcake pans with cupcake liners, and preheat your oven to 175°C/350°F. Peel and finely grate your carrots, and set aside. In a large bowl, whisk together the sugar and oil until well blended. Add the eggs one at a time, whisking well. In a medium bowl, mix together the flour, cinnamon, nutmeg, salt and baking soda. Stir the mixture into the wet ingredients, followed by the grated carrots (and nuts, if using). Scoop the batter into the muffin tins, filling the cupcake liners about 3/4. Bake them for about 15-20 minutes, until a tooth pick comes out clean. These are almost impossible to over-bake, but you don’t want them to burn on top. I do, however, find that it’s best to err on the side of 20 minutes, to make sure the cakes aren’t too wet at the bottom (they really are extremely moist). It’s also a good idea to turn your pan around halfway through baking, to ensure the cupcakes rise evenly, and not more on one side than the other. Let cool for five minutes in the pan, then transfer to a cooling rack and let cool completely before frosting. Beat together the melted butter, orange and lemon juice, orange zest and icing sugar, beating for a good 5 minutes or so, until the mixture becomes light and airy, and has a spreadable consistency. Set aside until the cupcakes have cooled completely, then add little dollops to each cake, spreading it out with a knife. Makes 24-28 little cupcakes, depending on the size of your cupcake liners.